Interview Questions Operating System | The Daily Programmer '+g+"
What is a process? 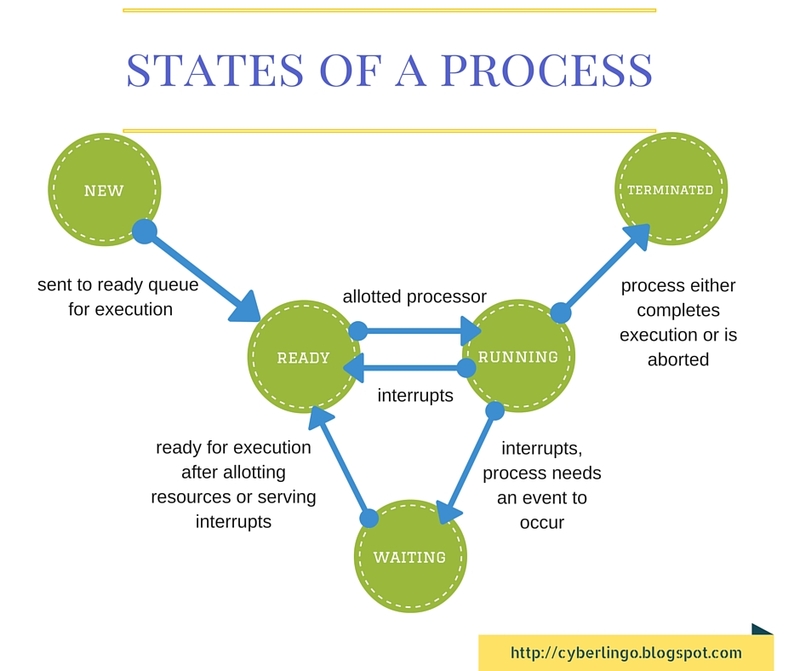 What are the states of a process? A process is a program in execution. New : The process has just arrived. Ready : The process is waiting in a queue to be executed. Running : The process is currently running and utilizing resources. Waiting : The process is waiting for resource allocation or any event (say I/O) to occur. Terminated : The process either finished execution or aborted. What are the necessary conditions for a deadlock? Mutual Exclusion, Hold and Wait, No Preemption, Circular Wait. The phenomenon of execution time increasing upon increasing the number of frames allocated to virtual memory is called Belady's anomaly or FIFO anomaly. Thrashing refers to high paging activity when more time is being spent on paging instead of execution of processes. Interrupts are a hardware mechanism that signal the processor that a certain resource is needed or for event handling. An interrupt handler receives this interrupt signal and “tells” the processor to take action based on the interrupt request. What is a binary semaphore? A binary semaphore is an integer, which takes only 0 and 1 as values and is used to implement mutual exclusion and synchronize concurrent processes. What are short, long and medium-term scheduling? Long term scheduler controls the degree of multiprogramming and decides which programs are to be loaded into main memory. Medium term scheduling is part of the swapping function. The scheduler is used to swap the processes in and out of memory. Short term scheduler decides which process should be allocated the processor.